• Recognise that oscillators consist of 3 essential parts. • Describe the essential parts of an oscillator. • State the reasons for using positive feedback. 1. An amplifier. This will usually be a voltage amplifier and may be biased in class A, B or C.
2. A wave shaping network. This consists of passive components such as filter circuits that are responsible for the shape and frequency of the wave produced. 3. A POSITIVE feedback path. Part of the output signal is fed back to the amplifier input in such a way that the feed back signal is regenerated, re-amplified and fed back again to maintain a constant output signal. Commonly an oscillator is constructed from an amplifier that has part of its output signal fed back to its input. This is done in such a way as to keep the amplifier producing a signal without the need for any external signal input as shown in Fig. 1.1.1. It can also be thought of as a way of converting a DC supply into an AC signal. The feedback in the amplifier section of an oscillator must be POSITIVE FEEDBACK. This is the condition where a fraction of the amplifier's output signal is fed back to be in phase with the input, and by adding together the feedback and input signals, the amplitude of the input signal is increased. For example, a common emitter amplifier creates a phase change of 180° between its input and output, the positive feedback loop must therefore also produce a 180° phase change in the signal fed back from output to input for positive feedback to occur. The result of a small amount of positive feedback in amplifiers is higher gain, though at the cost of increased noise and distortion. If the amount of positive feedback is large enough however, the result is oscillation, where the amplifier circuit produces its own signal. When an amplifier is operated without feedback it is operating in "open loop" mode. With feedback (either positive or negative) it is in "closed loop" mode. In ordinary amplifiers negative feedback is used to provide advantages in bandwidth, distortion and noise generation, and in these circuits the closed loop gain of the amplifier is much less than the open loop gain. 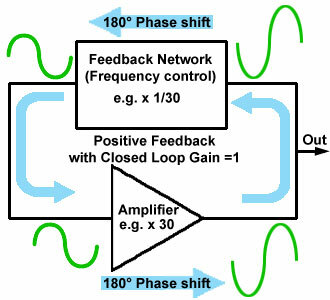 However when positive feedback is used in an amplifier system the closed loop gain (with feedback) will be greater than the open loop gain, the amplifier gain is now increased by the feedback. Additional effects of positive feedback are reduced bandwidth, (but this does not matter in an oscillator producing a sine wave having a single freqency), and increased distortion. However even quite severe distortion in the amplifier is allowed in some sine wave oscillator designs, where it does not affect the shape of the output wave. In oscillators using positive feedback it is important that amplitude of the oscillator output remains stable. Therefore the closed loop gain must be 1 (unity). 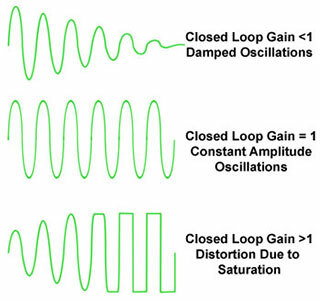 In other words, the gain within the loop (provided by the amplifier) should exactly match the losses (caused by the feedback circuit) within the loop. In this way there will be no increase or decrease in the amplitude of the output signal, as illustrated in Fig. 1.1.2. Positive feedback must occur at a frequency where the voltage gain of the amplifier is equal to the losses (attenuation) occurring in the feedback path. For example if 1/30th of the output signal is fed back to be in phase with the input at a particular frequency, and the gain of the amplifier (without feedback) is 30 times or more, oscillation will take place. The oscillations should take place at one particular frequency. The amplitude of the oscillations should be constant. Make sure that positive feedback occurs only at one frequency, the required frequency of oscillation. This may be achieved by ensuring that only signals of the required frequency are fed back, or by ensuring the feedback signal is in the correct phase at only one frequency. Make sure that sufficient amplification for oscillation can take place only at the required frequency, by using an amplifier that has an extremely narrow bandwidth, extending to the frequency of oscillation only. Use amplifiers in "switch mode" to switch the output between two set voltage levels, together with some form of time delay to control the time at which the amplifiers switch on or off, thus controlling the periodic time of the signal produced. Methods 1 and 2 are used extensively in sine wave oscillators, while method 3 is useful in square wave generators, sometimes called aperiodic (untuned) oscillators. Oscillators using method 3 often use more than one amplifier and timing circuit, and so are called multivibrators (more than one oscillator). As shown in Fig. 1.1.1 oscillators must have an amplifier, a positive feedback loop and some method of controlling the frequency of oscillation. In RF sine wave oscillators the frequency may be controlled by an LC tuned circuit, but as well as controlling the frequency of oscillation, there must also be some means, such as negative feedback, of stabilising the amplitude of the signal produced. Without this stabilisation the oscillations would either die away and stop (damped oscillation) or rapidly increase in amplitude until the amplifier produces severe distortion due to the transistors within the amplifier becoming "saturated" as shown in Fig. 1.1.2. To produce a constant amplitude output the gain of the amplifier is automatically controlled during oscillation.